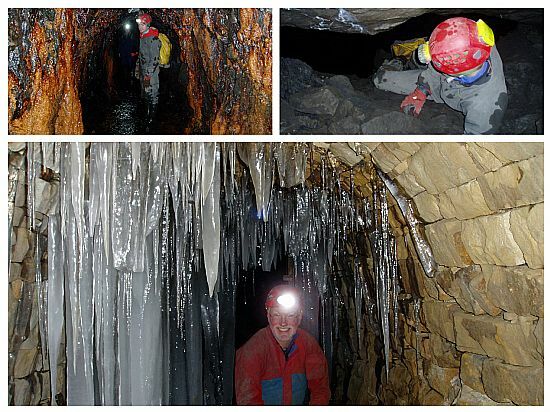 Experience a fantastic day exploring the mine tunnels of Nenthead Mines, including the spectacular underground Ballroom. Alternatively if you would like more information on what we can offer please go to our underground page. The Underground Lead Mine Adventure day takes place at Smallcleugh Mine in Nenthead (Cumbria), with the day starting and finishing at the Heritage Centre car park (belonging to Nenthead Mines) just to the South of the centre of the village (just beyond the public toilets). We will meet at the Heritage Centre car park (Grid ref: NY 781 435) at 9:45am. It is anticipated that the day will finish approximately between 3pm and 3:30pm. What does the Underground Lead Mine Adventure involve? There will be an introductory briefing and all the specialist kit will be given out. There is then a 10-15 minute walk up to the mine entrance. We will be underground for approximately 4 hours and we can have our packed lunch, as well as bacon sandwiches in the Ballroom (The bacon sandwiches are supplied by Pinpoint Adventure and the Ballroom is a huge chamber). It is worth pointing out that Smallcleugh mine is not a ‘show mine’ like Killhope or Beamish. A lot of the journey simply involves walking, but there are sections of stooping, hunkering and crawling. Anyone with reasonable fitness should comfortably manage the 4 hours underground however. Yourself (a basic level of fitness is required to go in to a lead mine; but the ability to crawl and bend down for short distances will be essential at times). Small rucksack; containing a packed lunch and fluid/drinks for the day. Old clothing – socks and trousers may get wet from the knees downwards. Wellies (These may also get wet). Knee pads are recommended but not essential. Participant Information Forms – filled out (to be given to Tom when you arrive). Wellies – if participants don’t have their own. All safety/emergency kit, including First Aid. Qualified and experienced instructors (Normally this will be Ian and Tom). If there are any questions you wish to ask please contact Ian or Tom (see below).